View of Mt Feathertop from the Red Stag Deer Farm. This ride takes in some of the most impressive scenery on the Murray to Mountains rail trail, and ends at a restaurant which specializes in locally sourced venison dishes. The ride is a return trip from Bright to the Red Stag Deer Farm just off the Alpine Road. You ride past some of the old railway stations on the old Wangaratta-Bright line, now rest stops for cyclists. The ride offers spectacular views up the Ovens River valley to the peaks of Victoria’s high country. 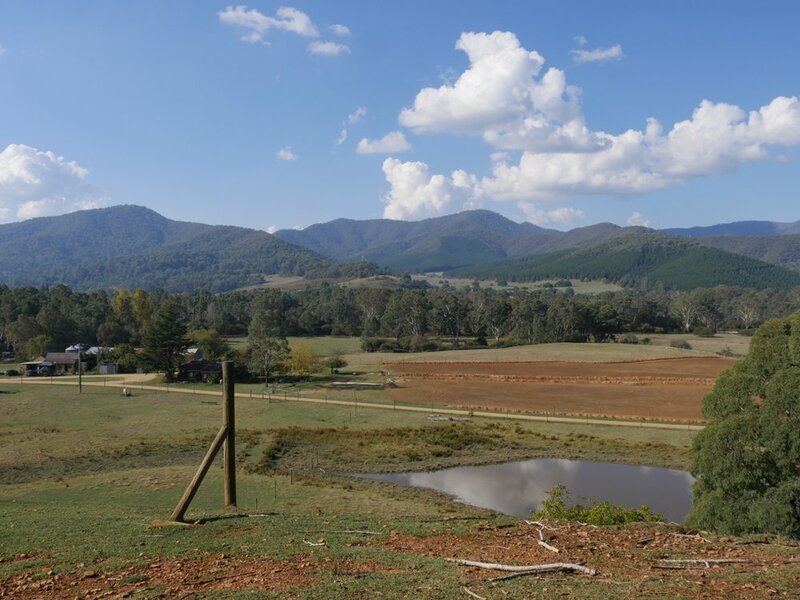 These mountain views are awesome, Mt Buffalo on the ride and superb views of the Australian Alps including Mt Feathertop from the deer farm. At the deer farm, you can walk around and check out the residents including deer (of course) and emus. Bright is amply furnished with cafes and restaurants. Along the route of this ride, Porepunkah has several coffee shops. Other trailside coffee shops tend to open, only to vanish after an unpredictable period of operation. The ride ends at the Red Stag Deer Farm restaurant. 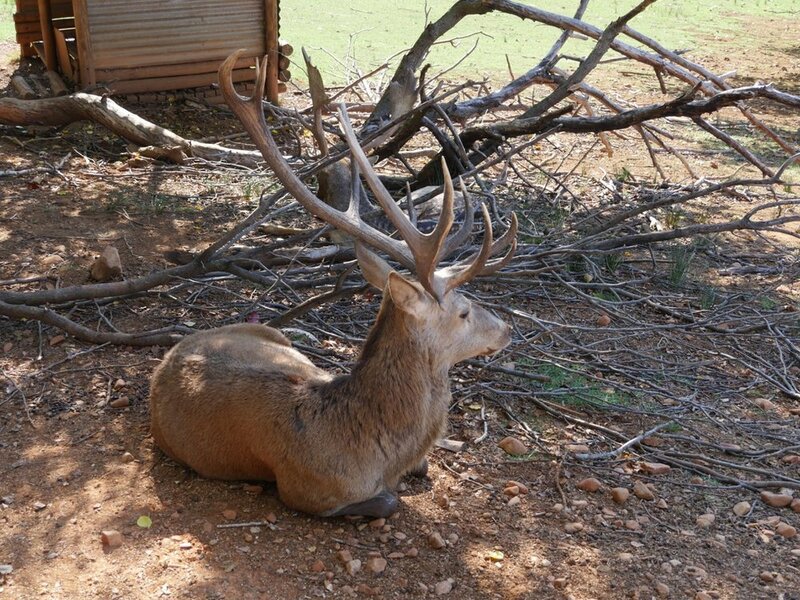 As well as deer, the Deer Farm has a large collection of native and exotic animals. Very slightly downhill, or flat, except for the final 6km to the Deer Farm. In this section of the ride, there is a long, steady climb of about 4km and a final short, sharp pinch to the farm. Distance: 21km approx. Circling the clock tower in the centre of Bright, turn left into Burke Street. The Murray to Mountains rail trail begins at the end of the street. Turn right, after a very short distance, where the rail trail intersects with the Bright to Wandiligong trail. Continue with the old railway station on your right. After a further 2km, cross the Myrtleford – Bright Road. Porepunkah is 4km ahead. In Porepunkah, follow the trail past the Rail Trail Café. Immediately after you pass the picnic shelter and barbecues, turn sharp left, downhill, to cross under the Myrtleford – Bright road. Continue towards Eurobin station. On your left you are rewarded with slowly changing views of the massive bulk of Mt Buffalo. On the slopes to your right are occasional vineyards. Eurobin Station offers public toilets and a place to tether your bike if you would rather motor the last 7km to the Deer Farm. 1km west of Eurobin station turn left, crossing the Myrtleford – Bright road and entering Wobonga Lane. Cross the Ovens River and immediately turn left into Hughes Lane for the last 5km to the Deer Farm. Hughes Lane is flat for some distance, then begins a long, steady climb. Hughes Lane eventually levels out and drops. At the bottom of the slope turn sharp right and up a short, steep pinch to the Deer Farm itself. Return to Bright via the same route. Steps 8 to 11 of this ride make a side trip on the Myrtleford to Bright section of the Murray to Mountains Rail Trail. For a shorter route, the ride may be done as a return trip from either Myrtleford or Porepunkah. Note that the map does not include the driveway into Red Stag Deer Farm, or the connection from Burke Stree to the rail trail.